CAO has taken the flavors contained in their best-selling Flavours by CAO cigars and cigarillos and made them available for pipe smokers using high grade Virginias and black Cavendish (depending on the blend). 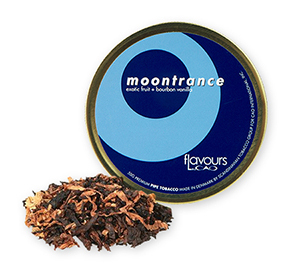 This premium aromatic pipe tobacco is made in Denmark by Scandinavian Tobacco Group exclusively for CAO. Bella Vanilla pipe tobacco contains vanilla beans from Madagascar, the premier source of vanilla in the world. This exquisite extract is gently misted into a blend of mild Virginia flake tobaccos, creating a rich taste with an intoxicating aroma. 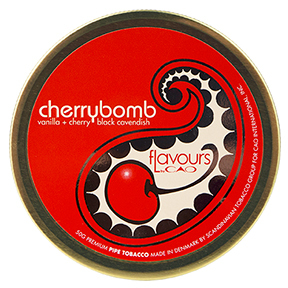 Cherrybomb pipe tobacco combines the essences of Maraschino Cherries, Madagascar Vanilla, and Black Currant, resulting in a mild to medium taste. The Cherrybomb's "explosive" flavor and aroma makes it seem good enough to eat. 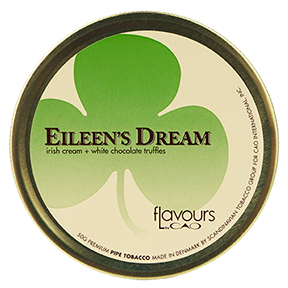 Eileen's Dream offers a combination of Irish cream and white chocolate truffles. Fine Irish whiskey, frothed cream, and coconut milk make up the Irish cream, and the white chocolate truffles is derived from a mixture of hazelnut paste, white chocolate, ground almonds, cocoa, and vanilla extracts. Truly a dream to smoke. 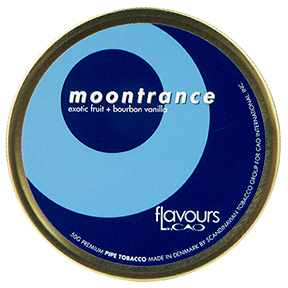 Moontrance pipe tobacco is an entrancing blend of exotic fruit and bourbon vanilla. The bourbon vanilla with its caramel-like sweetness is mixed with Georgia peaches and other organic fruits. A splash of white Hawaiian honey is added for its tropical essence.